bbq factory Replacement Brinkmann Heavy-Duty 810-8501-S Burner,Carryover Tubes,Heat Plate, Grill Grates , selling for $119.99 brand new. Manufactured by bbq factory. There are 1 units left brand new. If you are looking for parts, the BRAND and MODEL No.# (if provided, this item might be compatible with) listed below are just for your reference as shopping guide. Please DO double check the size and shape of your original parts, and compare with ours before ordering. Your payment will be regarded as agreement of item specifications. 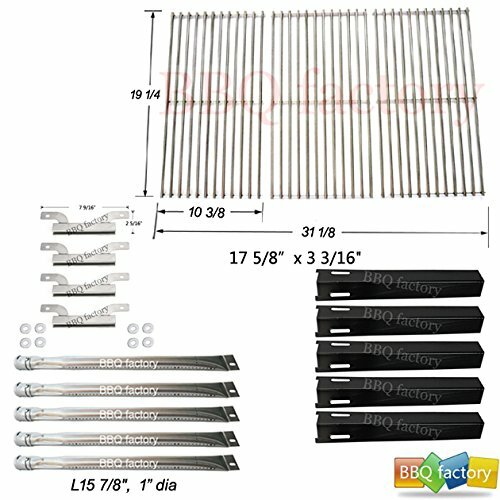 Get your Brinkmann 5 burner Heavy Duty gas grill 810-8501-S working again with this grill repair kit. This grill rebuild kit includes 5 burners, 5 heat plates, 4 carryover tubes, and 1 set of 3 cooking grids and is made to fit Brinkmann 810-8501-S grills. Use part numbers and dimensions given to determine if these aftermarket replacement grill parts will fit your Brink Mann 810-8501-S barbeque gas grill. Heat Plates may also be referred to as heat shields, heat tents, burner covers, flavorizer bars, reflector bar. Replaces heat tent part numbers 600-7100-0. Replaces burner part numbers 812-7140-0. Replaces crossover channel part numbers 600-8502-4.